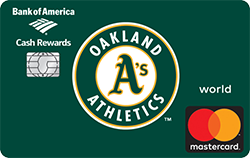 Oakland Athletics Extra Bases Mastercard new cardholders enjoy 0% financing on purchases for the first 12 billing cycles. As an extra incentive, after qualifying first purchases of $500 or more, you receive an additional 15,000 First Use Bonus Points, redeemable for a $150 statement credit. The rewards continue with the World Mastercard from Bank of America gives you a point or more for every dollar spent with the card anywhere Mastercard is accepted. Show your support for the Oakland Athletics this season and be rewarded in return for your loyalty by applying here and selecting the Athletics as your team.